Online shopping nowadays becomes so popular. Well through online shopping, customers can now browse their favorite items and buy them with just a click! Afterwards, these items will be instantly delivered in their doors. And because of the high demands of online shopping, many online stores rise. And two of the popular online stores today are Lazada and Aliexpress. Have you already tried shopping in these two online stores? In my case, I already did specially when buying gadgets like mobile phones and its accessories. Shopping online at popular stores with the gadgets you desire can really save time, money and effort. Imagine how much time, money, and effort are save when you do not anymore need to go to the actual mall or store to window shop and canvass the price of the gadgets you need to buy. You just need an internet connection then browse, click, order, and pay using your paypal or credit or debit cards then you will have instantly the gadget you dream of. Two of the popular and in-demand phones today like Cherry Mobile and Samsung can easily bought online especially with the online shopping site like ShopBack. Well, when I visited this site, it seems that I'm in a big mall shopping and travelling from one store to another as all of the types of retail items and services were there ranging from tech to food to lifestyle and to variety of customer needs. So feel the ease of online shopping and try these great promos at your fingertips. 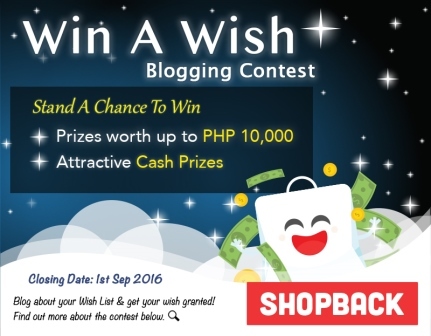 Meanwhile, you can also join the Shopback Win a Wish Promo. The promo is so easy. Just us ShopBack with your wish items to have and we’re you’re chosen as a lucky winner, you can win the items you put in your wishlist. The complete details and mechanics of the promo can be found here: Win a Wish Promo.